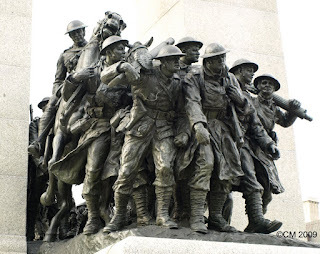 I just posted on Kailana's blog that I was at the War Memorial today for the ceremonies, along with my husband and thousands of other Canadians. One good thing about living in Ottawa! I find this War memorial so beautiful. This afternoon when my husband and I walked past it on our way home, there were all kinds of vets and families taking pictures of the wreaths and themselves (the vets especially) in front of the memorial. It was a beautiful day to pay our respects. Thank you for posting the photo!